To watch videos on book and cooking demonstration, please visit www.ahbonbon.com. Food Made at Home is the key to health and fitness by helping readers eliminate toxins from food and eat delicious nutrient-dense meals that follow a healthy eating-pattern. 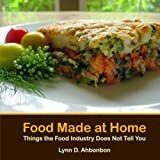 This book contains delicious international traditional recipes that Lynn Ahbonbon has modified to be healthier, tastier, and easier to prepare. Each recipe includes interesting cultural background information about the dish as well as the nutritional benefits.